Since the early months of the Russo-German war, many German units using the Red Army prisoners as auxiliaries for them. Then, various battalions consisting of Soviet Union citizens was formed and deployed to help the Germans as saboteur, spies, and fought Soviets partisans and the Red Army. Like many other German military service, the Abwehr think that Germany weakness of human resources when confronted with a giant Soviet Union can be offset through the support groups of local residents if Germans, instead oppressed them, were arming and leading these people. One of the main proponents of this policy is Dr. Hauptmann Theodor Oberländer, a former economics professor from the University of Königsberg in East Prussia. A former political advisor to the Battalion 'Nachtigall', an Ukrainian volunteer formations, he was one of the officers who urged the Abwehr to seek allies among the population of the Caucasus: Georgians, Armenians, Azeri, Ossetia, Chechens, Abkhazians, and various other small groups in region. Some of them were only conquered by Russia less than a century earlier and saw the Germans as liberators. Oberländer ideas were later embodied in a Caucasus volunteer’s formation known as the Sonderverband Bergmann, where he became its first commander. 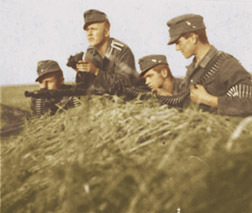 The unit is listed under the guise as an Abwehr formation because Hitler initially did not believe in the use of citizens of the Soviet Union in a combat role. Formed in Neuhammer by OKW / AMT Ausland Abwehr II, this unit consists of prisoners of war and deserters from the Red Army made up of Georgians, Armenians, Northern Caucasus, and Azeri. Abwehr II itself is a section of German military intelligence service that responsible for sabotages activities and fomenting rebellion among the natives. Sonderverband Bergmann formed as battalion strength of about 1,200 people, consisting of 300 Germans and 900 Caucasians. The unit itself is divided into five companies: the 1st and 4th companies consists of Georgians and Armenians; the 2nd company consisted Dagestan; the 3rd consists of Azeri; and 5th company, the company staff officer, filled out by the Georgian emigrants. After finishing their initial training in Neuhammer, these volunteers were sent to Mittenwald to be trained as a mountain infantryman. They were armed with rifles, submachine guns, mortars, and anti-tank cannon. According to the German plan, the unit will be used for staged diversion and sabotage. A special unit, called "Tamara” and consisted 130 Georgian volunteers, got a special training to fomenting rebellion in Georgia. In June 1942, Sonderverband Bergmann was placed under the 1st Panzer Army which became spearheading of the German attack in the Caucasus. Those Caucasus volunteers were mainly used for "psychological warfare", where its companies managed to attract many residents of the Caucasus to side with Germany. One group even managed to attract 300 people deserters from the Red Army, which later joined with the Sonderverband! So successfully the unit’s "psychological warfare" campaign that between September and November 1942 Sonderverband Bergmann managed to establish four additional companies as well as many squadrons of cavalry from among the Red Army deserters and prisoners as well as local volunteers. Therefore, towards the end of 1942, the unit manpower was increased to 2,690 people, including 240 theirs German cadre. In September 1942, several members Sonderverband Bergmann parachuted into line behind the Soviet Union with the mission to gathering intelligence and conduct sabotage. A group of 25 Germans and Chechens under the leadership of Hauptmann Lange parachuted into the area of ​​Grozny. In a mission codenamed "Unternehmen Shamil", they were ordered to wage rebellion among the Chechens and seize and retain the oil refineries in Grozny until the arrival of German panzers. But the German attempt to break through into Grozny between 25 to 27 September 1942 failed. The mission was canceled and the remaining group of special forces who had landed in the Chechnya's oil fields had returned to base. Meanwhile, the main group of Sonderverband Bergmann engaged in combat with the Soviet guerrillas in the rear of German army, especially in the Mozdok-Kalchik area. Then they were also thrown to fight against the Red Army in the frontline. On 29 October, the 1st and 4th companies were sent to the Nalchiks front while the 2nd and the 3rd companies were sent to Ishcherskoye. Although fought vigorously, as it has no heavy weapons and outnumbered compared to the opposing force, Sonderverband Bergmann suffered heavy casualties. At the end of December, the 1st Panzer units were forced to retreat to north to avoid the cut from other German forces in southern Russia after the Red Army launched a counterattack at Stalingrad. During the German withdrawal from the Caucasus, Sonderverband Bergmann acted as a rear- guard, where they protect the withdrawal of the Germans into Taman peninsula and destroying various industrial objects. They were later escaped from the Caucasus through the Kerch Strait and arrive in the Crimea in late February 1943. In the summer of 1943, Sonderverband Bergmann upgraded into a regiment that consisted of three battalions: the 1st Battalion (Georgia), the 2nd Battalion (Azerbaijan), and the 3rd Battalion (North Caucasus). They were reinforced by 270 North Caucasus soldiers from the I. Kaukasiche Luftwaffe Feld-Bataillon. The German defeat at Stalingrad cause problems in Sonderverband Bergmann. Many of its members demoralized, thus becomes easy prey for the Soviet agent who infiltrated into the formation. Even some major elements of the regiment were almost defected to the Red Army! However, the conspirators, who consisted of three officers, three cadet officers, two noncommissioned officers, and four soldiers, captured by the German Military Police. They were later tried and sentenced to death. Between June 1943 and February 1944, Sonderverband Bergmann was in the Crimea under Commander of Army Group A/Crimea. After that, the regiment was divided for the first time when the 2nd Battalion, which had fought briefly under the Luftwaffe 5th Field Division along the Bug River in southern Russia during the month of February to early March , was ordered to report to the 2nd Regiment of Freiwillige-Stamm-Division (Division Depot Volunteers) in Mende, France. This Azerbaijani battalion later was moved to Warsaw, where they are involved in the German attempt to suppress a mass uprising in the Polish capital that killed hundreds of thousands of civilians. According to German records, those Azeri have good skills for such an operation. Meanwhile, in late October 1943, the 1st Battalion and a cavalry squadron from the regiment were transferred to the 153rd Infantry Division on the Perekop Isthmus. They were later involved a fierce battle against the Red Army during the winter of 1943-1944. In March 1944, the 1st and the 3rd Bergmann battalions were sent to Romania before being relocated to southern Greece, where they served under the German LXVIII Corps. There they were reinforced by the remnants of Nordkaukasiche Infanterie Bataillon 802. Both Bergmann’s battalions were in Greece until September 1944, where they were moved into Yugoslavia during German withdrawal from Greece. On February 12, 1945, the headquarters of the Bergmann Regiment and theirs 13th and 14th squadrons were disbanded. But the third battalion continued to operate independently. Meanwhile, after putting out the Polish uprising in Warsaw, the Bergmann’s 2nd Battalion was sent to Modlin and placed under the command of the IVth SS Panzer Corps. After fighting on the Vistula front, in April 1945 they were sent to Denmark and placed under the command of the 599th Russian Brigade which fought on the German side. They served in the Scandinavian country until the end of the war. Two other Bergmann’s battalions fought in Croatia until the end of the war and surrender to Western Allied in Austria.